A petrol station displays a sign reading "No Gas" (in Portuguese) in Brasilia, Brazil on May 28, 2018. Petrobras shares fell as much as 9 per cent on Monday after Brazil’s government offered new fuel subsidies and softened the oil producer’s pricing policy in a bid to settle a truckers’ strike that has wreaked havoc on Latin America’s largest economy. 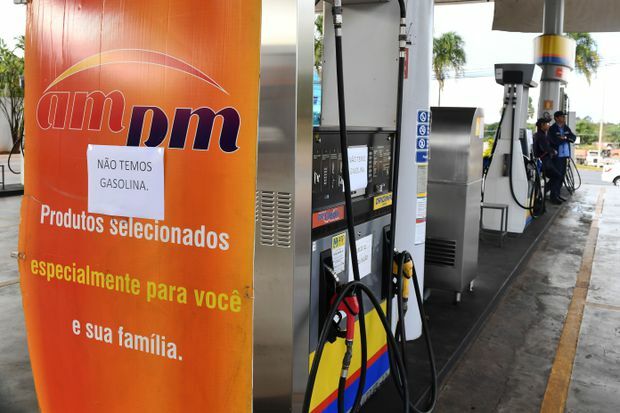 As a result of tax cuts and subsidies announced by President Michel Temer late on Sunday, domestic diesel prices would fall 0.46 real (0.16 cents) a litre, or about 13 per cent of the current price at the pump, and remain frozen for 60 days. A truckers’ association behind the countrywide protest told drivers to get back to work, adding that it expected the number of blockades of key roadways to decline significantly by Monday afternoon. Yet to avoid breaking budget rules, the Brazilian congress would need to approve several tax measures, a daunting endeavour ahead of this year’s parliamentary and presidential elections. The measures represented Mr. Temer’s latest concessions to the truckers, whose strike has won popular support even as it has severely hampered the flow of food, fuel and key exports in Latin America’s largest economy. Brazilian farm groups warned on Monday that production and exports of key commodities such as coffee and soy would fall if the truckers continue to block roads. Some 64 million chickens have starved to death as a result of the strike, meat group ABPA said on Sunday. Brazil is the world’s largest chicken exporter. As many as 150 poultry and pork processing plants have stopped production for lack of feed and storage space, the association has said. After the initial 60-day period price freeze, state-controlled Petroleo Brasileiro SA will start adjusting diesel prices monthly, a switch from its current policy of daily price changes. Should global diesel prices fall in coming months, the government could choose to trim subsidies, Finance Minister Eduardo Guardia said. Petrobras said in a securities filing that the government had agreed to compensate it for any losses. Still, its shares plunged to a four-month low, leading a broader sell-off in Brazil’s benchmark Bovespa index, which slumped 4 per cent. For years, Petrobras subsidized domestic fuel prices, boosting its debt load, a policy current chief executive Pedro Parente has tried to reverse. The policy contributed to the diesel price hikes that triggered the truckers’ rebellion. The pricing turmoil has raised questions about how long the market-friendly CEO will stay on. Petrobras on Friday denied the rumours, saying Mr. Parente had no intention of quitting. Renewed worries about Petrobras’ independence from political inference have shaved 113 billion reais ($39.3-billion) off its market capitalization since the truckers’ strike began a week ago. Brazilian steelmakers such as Cia Siderurgica Nacional and Usiminas may lose up to 20 per cent of their revenue in May owing to the strike, analysts from XP Investimentos said in a research note. Shares in food retailers Carrefour Brasil and GPA SA also fell as analysts warned their supply chains would suffer. Petrobras management separately urged its workers not to follow through on a strike planned for later in the week, saying that “paralysis and pressure for adjusting prices” would not be positive for the company or country as a whole. To partially offset the subsidies’ cost, which could reach as much as 9.5 billion reais ($3.3-billion) this year, and avoid missing its 2018 budget goal, Mr. Guardia said the government would cut spending by 3.8 billion reais ($1.3-billion). It will also have to hike taxes to offset an additional 4 billion real ($1.4-billion) loss from diesel tax cuts to avoid breaking budget rules. That would be partly paid for by an increase in payroll taxes that has struggled to win congressional approval for months, but would also require further tax measures that the government will unveil once that plan is passed, Mr. Guardia said. He also said the government will implement a variable tax on diesel imports that will kick in whenever global prices fall below local benchmark prices, protecting Petrobras’ competitiveness. Newspaper Valor Econômico had reported on Monday that Petrobras had proposed such a plan.